Touring is the opportunity to take all your best skills — your talent for music, your ability to connect with fans, your penchant for making people feel understood — and use them to make massive progress in a process that would otherwise take weeks, months, or years. When you’re on the road you have the opportunity to connect with people in a way that you simply don’t from behind the screen. You also have access to more people on a nightly basis to do that with, and on top of that, even if you’re a little rusty on your networking skills, it’s a chance to brush up on them over and over and over again for weeks at a time. 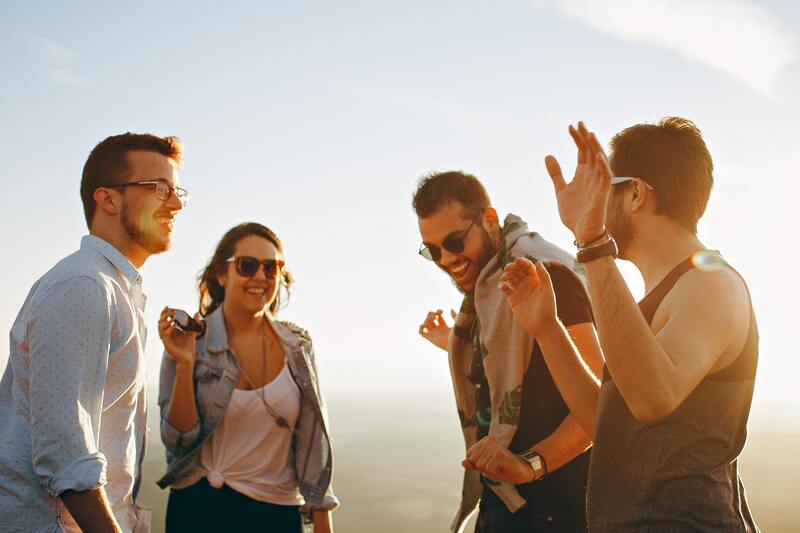 For these reasons and so many more, touring is just as much an incredible business opportunity as anything else, and one of the most powerful ways to make a lasting impact on the road is to find, meet, and connect with new fans. One of the best ways to get familiar with a city you’ve never played is to have the support of an already established local band. If they can join you for a show, or at the very least put out the word of your arrival to their followers, intro you to a venue, or in any other way offer their support, that’s going to be a huge help in getting the word out. I’m a big fan of the house show (or other intimate/unusual venues for shows) because I’m a firm believer that these kind of settings allow for much more one-on-one time, and of course, a stronger connection. When your fans can simply have a conversation with you over a drink on the couch after your set, the odds of you connecting — and I mean really connecting on a personal level — are so much stronger. Anything that leaves your fans feeling like they know you just a little bit more is going to leave such a strong impression, and you can bet you’ll leave with at least a few new fans. This one is a little bit more work, but it’s a lot of fun. When I work press for my PR clients, one of my favorite strategies is to find out what their passions are and then approach outlets that cover those topics. Going outside the music industry and into other areas is a great way to find fans and instantly bond over a shared interest. You’re a lot more likely to find and keep fans who believe in the same things you believe in, and if you can get straight to the heart of it by focusing on the belief/passion rather than the music, that can be a really rewarding (and quick!) way to grow. There are a few different ways to incorporate this into your tour. The first is simply making time for your passions and finding a way to document them on your socials. For instance, if you’re all big fans of craft beer, maybe you make it a point to stop at one brewery in every city you visit and you document it all in a mini-series with a set hashtag or a blog or exclusive mailing list content. Part of this means marketing to existing fans, but it also means attracting new ones, as well as sparking the interest of some of your more passive fans. It’s a really fun way to get outside your comfort zone, expand your visibility, and have some fun. Finally, there’s good ‘ol Facebook Ads. Knowing how to properly use Facebook ads to target new fans whose cities you’re about to tour through, is a great way to start drumming up interest and getting in front of new faces. Just be sure you’re getting specific and targeting people in the correct age range, city, interests, etc. Angela Mastrogiacomo is the founder and CEO of Muddy Paw PR, where her artists have seen placement on Alternative Press, Noisey, Substream, and more, as well as the Director of Community and Events for Music Launch Co. She’s also the owner of music blog Infectious Magazine. She loves baked goods, a good book, and hanging with her dog Sawyer.